This elegant period property has recently been refurbished to provide cutting-edge serviced office space. Work spaces enjoy breathtaking views over the city, as well as a range of business amenities that will help your business to flourish. A well-connected business address, in the heart of the city, tenants will benefit from the use of many on site facilities and services, such as full accounting and HR, product certification, meeting and conference rooms, and car parking on-site. Located in one of the most prestigious and demanded addresses in St. Petersbourg, this building consists of fully furnished offices and meeting rooms, all technologically equipped to a high standard. This stylish building, recently renewed in respect of the original classicist architecture, is provided with parking facilities, 24/7 security, on-site restaurant, audio-visual technology and administrative staff support. The building is located within a wide range of amenities and is well served by public transport and by car. This outstanding centre occupies a Class A office building in the centre of the city. Many offices boast stunning views over the river. This is a prestigious location, sure to impress your clients, with 24 hour access, conference facilities and beverages. The centre is easy to access by road and rail, with well-connected Moskovosky station just one stop away. 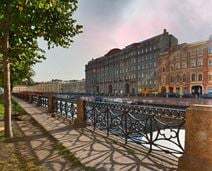 St Petersburg has a long maritime history and is a major centre for shipbuilding, with more than 40 enterprises in the sector.